Nutrition professionals find pros and cons with this newly proposed dietary pattern. The Paleo diet, with its plentiful animal protein, and the no-animal-products vegan lifestyle may seem as far apart as two food philosophies can get, but a new diet trend combines the two in an attempt to appeal to health-conscious individuals searching for a new way of eating. Nutrition professionals should be aware of the components of this new diet. • Plants: Hyman recommends that vegetables and fruits make up 75% of daily dietary intake. • Fats: This diet focuses on omega-3 fats, and fats from nuts, coconut, and avocados, and includes some saturated fat from grass-fed or sustainably raised animals. The plan suggests avoiding vegetable oils. • Nuts and seeds: "They're full of protein, minerals, and good fats, and they lower the risk of heart disease and diabetes," Hyman writes. • Dairy: Hyman disagrees with mainstream nutrition advice about dairy, saying that dairy "contributes to obesity, diabetes, heart disease, and cancer, and may increase (not decrease) the risk of osteoporosis." • Gluten/Grains: Hyman takes the controversial view that wheat is altered as "Franken Wheat" and that all grains raise blood sugar and can trigger autoimmune reactions. • Beans: While Hyman admits beans are a great source of fiber, protein, and minerals, he suggests limiting them. His concerns include digestive problems, blood sugar spikes in people with diabetes, the possibility that lectins in beans may create inflammation, and that the phytates in beans may impair mineral absorption. • Meat: Hyman recommends people eat meat or animal products "as a condiment," and only consume grass-fed and sustainably raised meats. He feels that "sustainably raised, clean meat" is healthful, but "puts pressure on the planet" and should therefore be limited. Elsewhere in the blog post Hyman recommends choosing "small, omega-3 fat-rich fish, such as sardines or wild salmon" to limit mercury intake. • Sugar: In the Pegan plan, all forms of sugar should be used occasionally and sparingly. So how healthful is the Pegan diet plan? Our experts weighed in on the positive as well as negative elements of this diet. "This combination plan has some of the characteristics that should be part of any healthful dietary pattern," says Penny M. Kris-Etherton, PhD, RD, CLS, FAHA, FNLA, FASN, a distinguished professor of nutrition at Pennsylvania State University, "like fruits and vegetables, good fats, adequate protein, food products raised in a sustainable way, and low-mercury fish." Janet Bond Brill, PhD, RDN, FAND, a cardiovascular nutritionist and author, also sees some positives in Hyman's position. "Fresh and local is great," Brill says, "provided that you have the access and money to buy it. I like that Dr. Hyman says to 'use meat as a condiment,' and I love the advice to increase intake of fruits and vegetables and to eat more fish." Vandana Sheth, RDN, CDE, a spokesperson for the Academy of Nutrition and Dietetics (the Academy), agrees there are some positive recommendations in the Pegan plan. "The pros of this dietary pattern are its emphasis on vegetables, fruits, and omega-3 fats, and the fact that it provides adequate protein," Sheth says. "But, although the general emphasis on heart-healthy fats, increased intake of vegetables and fruits, and getting adequate protein are a good foundation to a healthful diet, I disagree with the recommendation of avoiding or minimizing grains, limiting intake of beans, and avoiding dairy as part of an overall eating pattern. These foods have been associated with positive health benefits." The 2015 Dietary Guidelines Advisory Committee (DGAC) concluded that the overall body of evidence identifies a healthful dietary pattern as "higher in vegetables, fruits, whole grains, low- or nonfat dairy, seafood, legumes, and nuts; moderate in alcohol (among adults); lower in red and processed meat; and low in sugar-sweetened foods and drinks, and refined grains. "3 Following the Pegan diet would result in increased intake of vegetables and fruits, and it supports eating low-mercury seafood and nuts and limiting meats, sugars, and refined grains, but this diet severely limits whole grain and legume intake and eliminates dairy altogether. Sharon Palmer, RDN, plant-based nutrition expert and author of Plant-Powered for Life, says Hyman's recommendation to avoid gluten and wheat is unfounded. "There's a lot of misinformation on wheat among consumers today. Some health experts and book authors say that wheat is genetically modified in some way that makes it unhealthful. However, there's no approved GMO wheat on the market in the US. The varieties that are grown are conventionally bred like tomatoes, carrots, and most of our crops today. There's no evidence that people should avoid wheat—or gluten—for health benefits, unless of course they have a diagnosis of celiac disease or a legitimate food intolerance." The fact that legumes (beans, peas, lentils, and peanuts) are limited in the Pegan plan is problematic. Beans are a low-fat, high-fiber, phytochemical-rich source of protein that play an important part in the much-studied Mediterranean dietary pattern. They've been linked to many potential health benefits, including reducing cardiovascular disease and cancer risk and supporting weight management.5 Contrary to Hyman's assertion that people with diabetes should avoid beans, the American Diabetes Association ranks beans first on its list of the top 10 diabetes superfoods.6 "Beans are Mother Nature's gift to humankind," Brill says. "They're packed with nutrients for pennies on the dollar!" Kris-Etherton takes issue with the Pegan diet's restrictions on pesticides, antibiotics, and hormones. "There are strict regulations to control these things in the food supply, so people don't have to worry about safety," she says. For those who feel there's reason for concern, Brill recommends keeping advice realistic. For example, "the main problem is not pesticide-laden foods, it's that Americans aren't eating any fruits and vegetables," Brill says. "That's what we should be focused on. If people can afford and find organic, that's great. If not, eat fruits and vegetables anyway." "With respect to organic foods," Kris-Etherton says, "there's a lot of evidence that there's no difference in nutrient composition between organic and conventionally produced food. Local, farm-fresh foods may not, in fact, be better than quickly processed frozen veggies, for example, if the local product has been sitting on the shelf for days." For consumers choosing to eat organic, the Dirty Dozen, the Environmental Working Group's annual Shopper's Guide to Pesticides in Produce (available at ewg.org) can help consumers make the most of their budget. "I feel this kind of diet advice just adds to my clients' confusion," Brill says. "Talking about the dangers that lurk in common foods comes from a place of negativity and frightens people." Brill recommends emphasizing positive messages with her clients: "enjoy this" instead of "don't eat that." "I've found it's hard for most people to make the kind of radical dietary changes Hyman is calling for," she says. "But if Americans could just make a few simple changes in their diet, they'd make a big improvement in their health." Brill recommends clients eliminate soda and eat more plants and fewer animals. "Eat whole grains, increase intake of fruits and vegetables, enjoy more sweet fruits and less sweet treats," she says. 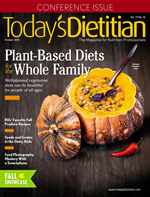 For clients determined to follow Hyman's advice, nutrition professionals should help them ensure they're getting adequate calcium and vitamin D, reassure them that increasing vegetables and fruits is more important than eating 100% organic, and be prepared to answer questions about wheat, gluten, and dairy. The Pegan diet is part Paleo and part vegan philosophy. It's also partly in line with mainstream nutrition advice and partly in direct opposition to that advice. Nutrition professionals should be aware of the components of this new diet to help clients make informed, healthful dietary decisions. 1. Hyman M. Why I am a Pegan — or Paleo-vegan — and why you should be too! Dr. Mark Hyman website. http://drhyman.com/blog/2014/11/07/pegan-paleo-vegan. Updated January 8, 2015. 2. Kohn J. Should we eat like our caveman ancestors? Academy of Nutrition and Dietetics website. http://www.eatright.org/resource/health/weight-loss/fad-diets/should-we-eat-like-our-caveman-ancestors. Updated January 19, 2015. 3. United States Department of Agriculture. Scientific report of the 2015 Dietary Guidelines Advisory Committee. http://www.health.gov/dietaryguidelines/2015-scientific-report/PDFs/Scientific-Report-of-the-2015-Dietary-Guidelines-Advisory-Committee.pdf. Published February 2015. 4. Denny S. How to add whole grains to your diet. Academy of Nutrition and Dietetics website. http://www.eatright.org/resource/food/nutrition/dietary-guidelines-and-myplate/choose-whole-grains. Updated February 9, 2015. 5. Beans for a healthy heart. US Dry Bean Council website. http://www.usdrybeans.com/nutrition/health-benefits-of-beans. 6. Diabetes superfoods. American Diabetes Association website. http://www.diabetes.org/food-and-fitness/food/what-can-i-eat/making-healthy-food-choices/diabetes-superfoods.html. Updated February 2, 2015.